I’ve been living on a budget for about a month now. Needless to say, it’s been challenging. Watching my spending has taught me that I swipe my card before I think, shop while I’m hungry and make poor decisions when I go out to bars (I mean, seriously, I have to act my age at least sometimes). Since it was my first month after creating a budget, I didn’t want to stress myself out too much. I’m the type of person who doesn’t respond well to feeling constrained when it comes to living my day-to-day life, so I promised myself I wouldn’t get too obsessed with it and end up ditching my plan all together. I was pretty terrified to check my Mint account at the end of the month, so with a glass of wine in hand, I got down to the nitty-gritty. I did turn around and walk out a few times — but not as often as I should have. Next month, I might try doing a spending freeze, just for coffee. As you can see, I didn’t quite hit all of my goals. See those red bars? 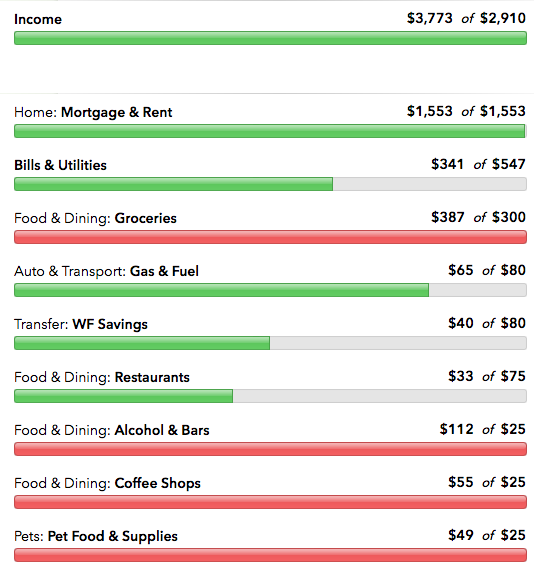 Those are the categories where I went over budget… whoops! On the plus side, I picked up another freelancing gig and made more this month than I did in September. Next month, I’m going to have to adjust my budget accordingly. It doesn’t look so pretty at first, but after taking a deeper look at it, I realized that the numbers didn’t turn out as ugly as I thought they would. I somehow managed to cut my electricity bill by $27. Florida was a bit cooler this month, meaning I didn’t need to run my AC all the time. I also remembered to turn off all the lights when I left my apartment each morning. I took a trip to Trader Joe’s and spent $30 less than I did on the same groceries the week prior at a different store. Since I did this at the end of the month, I realized a little too late that I should probably start shopping there instead. This decision will probably help me stay closer to my budget next month. I resisted the urge to indulge in Chipotle, meaning I was below my restaurants budget by $42. However, I clearly fed my caffeine addiction, which almost cancelled out the restaurant surplus. At least now I know I can budget less for restaurants and more for coffee. Besides, I spend a lot on groceries, and I should eat ALL of them. I forgot to transfer my second credit card payment this month, and therefore didn’t reach my budgeted amount in the bills category. I’m paying extra toward this debt help meet my goal to pay it off by the spring. I also tried couponing one weekend and had no idea what I was doing… so I gave up. I should probably start checking coupon websites before I do my shopping — they’re supposed to really help. The Cubs went to the World Series (and won!!!!!!! ), which meant I went out to bars more than usual — a lot more than usual. And according to the numbers, I had a pretty good time. 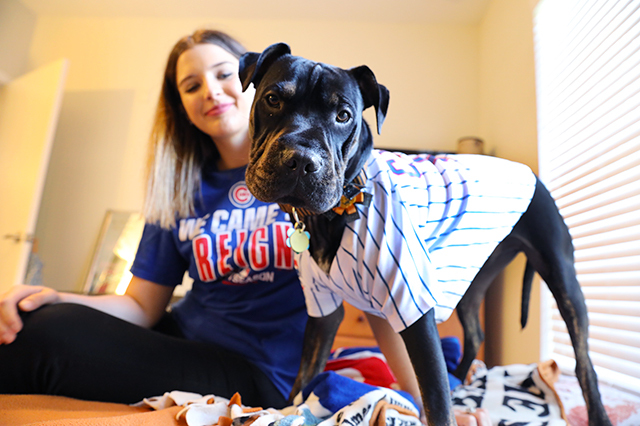 The big W also meant I bought my dog, Wrigley (yes, I am that person), his very own Cubs jersey and some new toys — which put me over budget for pet supplies. Overall, I learned a budget can be extremely helpful to help you reach your financial goals — if you follow them. As monumental as the Cubs’ World Series win was, I should’ve laid off the beer. Or, I should’ve at least chosen a cheaper drink — craft beer tallies up quickly on a tab.That said, there won’t be any more wild nights at World of Beer for me — time to cut back on the alcohol! Also, if I set a goal for paying off my credit card, I need to stick with it. To make sure I do this going forward, I decided to set up an automatic transfer. I’m going to keep a closer eye on my budget next month by checking my Mint account weekly to see what I should adjust; if those budget bars turn yellow, I’m going to freeze my spending so they don’t turn red. I’ve also decided to switch some things up; Trader Joe’s is definitely my new go-to grocery store, and I’m going to think twice before I walk into a coffee shop. Do you think I can stick with this budget? We’ll see! Wish me luck! Your turn: How do you stick to your budget? Let us know in the comments below! 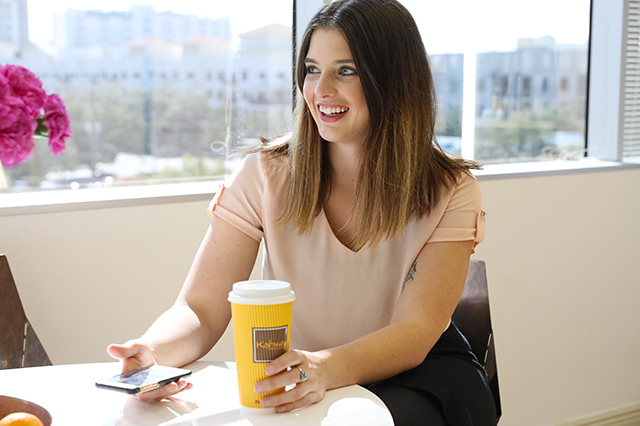 Kelly Smith is an editorial intern at The Penny Hoarder and a senior at The University of Tampa. Go Cubs Go!